Tea was introduced to this country in the mid-seventeenth century, and within 100 years it was a national beverage enjoyed by all classes, the direct cause of considerable changes in the times of meals and in social customs and, of course, of the introduction of the tea services so highly prized by housewives of every succeeding generation. 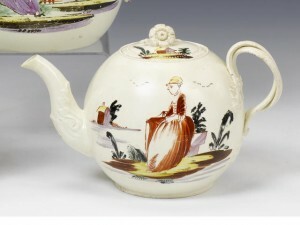 Pictured right: A Leeds creamware teapot and cover circa 1770 – The globular form with foliate spout and grooved double entwined strap handle with foliate terminals, painted in a limited palette with a seated lady, the reverse with a large low building with thatched roof and smoking chimney, beaded borders, the cover painted with a similar building beside the flower knop, 11.5cm high. 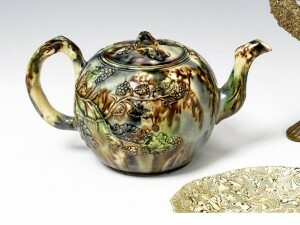 Sold for £780 at Bonhams London, April 2010. Image Copyright Bonhams. Other meals might be eaten from vessels of cream-ware or delft, from plates and dishes not necessarily matching, but tea drinking was from the beginning a ceremony in which women took a predominant part to the exclusion of their menfolk, and which demanded a proper set of pot, sugar basin, cream-jug, teabowls and saucers and, most important, a slop basin in which the proud owner might wash her precious pieces while seated at the tea-table. Pictured left: A good early Staffordshire teapot and cover of Whieldon type Circa 1750-60. – Globular with a crabstock handle and spout and a twig finial, sprigged in relief with fruiting vine branches extending from the sides of the handle, further leaves and grape sprigs on the cover, 11cm high. Value £2,500-£3,500. Image Copyright Bonhams. In spite of opposition from such wiseacres as the philanthropist Jonas Hanway (1712-1786) and later William Cobbett, who condemned the new habit as harmful and sinfully alien, it is a fact that as early as the 1740s over one million pounds of tea were imported annually into London alone, and our earthenware makers and, later, our porcelain makers were quick to meet the resultant demand, with the early support, we may note, of Dr Johnson who defended the ” elegant and popular beverage ” against Hanway and who, if legend is to be believed himself conducted experiments in the making of porcelain. 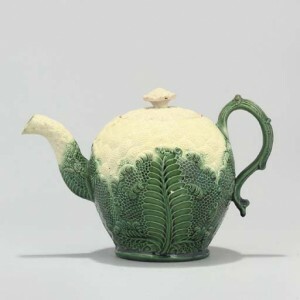 Pictured right: An English Creamware Cauliflower-Moulded Teapot And Cover Circa 1760, Probably Wedgwood – Naturalistically moulded, with foliate handle and cabbage-leaf spout 5 1/8 in. (13.2 cm.) high (2). Sold for £1,560 at Christies, London, January 2007. Image Copyright Christies. So to the most important single item of tea-drinking, the pot itself, to find whose origins we have to go back as far as the Chinese Sung Dynasty (420-79 A D.) when the drinking of tea was considered to be a serious masculine pursuit. The origins, but not the actual making as we know it, for at first tea was brewed actually in the tea-bowls, of any vessels of familiar tea-pot design were almost certainly winepots. Nevertheless, R. L. Hobson (Wares of the Ming Dynasty) refers to tea-pots of the Cheng Te period (1506-21), and as early as the latter part of the seventeenth century tea-pots which formed the greater part of the output of the great potting centre of Yi-hsing were exported to Europe with consignments of tea. These pots were made of stoneware in brown, buff and red, unglazed and relied for their beauty upon good design and shape (flattened globular, pear-shaped, or faceted) rather than upon elaborate detail. It was this kind of ware that was copied at Meissen and by the Elers brothers in this country, dating from the early eighteenth century, and though such pots were much too small for European use they were nevertheless the first to be made in England, developing into the familiar size by the middle of the century. It is always inevitable that with the introduction of any new article in household furnishing designers find themselves hard put to resist the temptation to allow their imaginations to run riot. 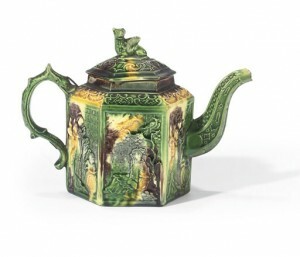 English teapots were for a time made in the forms of houses, ships, shells, birds, camels, and other animals, in salt-glazed or lead-glazed pottery. Even the great Whieldon, usually a master of restrained design, so far forgot himself as to fashion a pot in the shape of an elephant, and among the rarest of early Chelsea specimens are some in the shapes of Chinamen, dating to the early triangle period. One such, seated, holds a protesting parrot whose open beak serves as a spout, and another clasps a snake. We must remember that this was a time when anything Chinese was widely copied, and it is probable that pieces of this kind were facsimiles of actual Chinese wine-pots. Pictured left: A Staffordshire Creamware Hexagonal Teapot And Cover Irca 1760, Probably Thomas Whieldon – From a block-mould by William Greatbatch, with rectangular panels of Oriental figures at various pursuits against a fretted geometric pattern ground, the shoulders with scrolls and Chinoiserie fretwork, the fluted spout with ozier-pattern and elongated geometric panels, the finial formed as a griffin, recumbent, the scroll handle with a biting serpent terminal, enriched in a typical palette of green, ochre, brown and grey glazes 6 in. (15.2 cm.) high’ Sold for £1,125 at Christies, London, January 2008. Image Copyright Christies. At the other extreme the Staffordshire potters were obliged to make some kind of ware which would imitate the whiteness of porcelain, and we find white salt-glaze tea-pots made between 1740 and 1760. These, and other domestic wares were often decorated with ” sprigging,” the process of adding separately moulded relief decoration such as vine-pattern or prunus sprigs in Oriental style. Pieces so ornamented usually have ” crabstock ” handles and spouts fashioned in imitation of gnarled branches. Variety was introduced by the use of differently coloured clays for body and ornament, and from about 1745 onwards relief ornament similar in appearance was produced by casting, when it was sometimes picked out with japan gilding. This process was, of course, used for the making of the camels, ships, and so on. Confusion sometimes creeps in (especially in sales catalogues) between salt-glazed and lead-glazed ware made between about 1740 and 1780. The same shapes were used for both, often in the same potteries, particularly to make the ware usually classified as ” Whieldon,” which later, when fired at a lower temperature, became creamware. We find the same contrast between the colour of body and sprigged ornament, with the use of every colour between buff and dark brown or red. Whieldon pots were moulded in the shapes of cauliflowers and other vegetables, or supported on three lion’s paw feet in imitation of the silversmith’s work which was indeed the inspiration of these and of so many contemporary and later teapots. In addition to the decoration by means of moulding or applied ornament many pots, salt-glazed ones in particular, were beautifully painted in jewel-like enamels in many styles. The best work was done by two Dutchmen at Hot Lane, Cobridge, in the 1750s, including adaptations of Chinese scenes and motifs and Kakiemon designs, and our own English imitators, most probably from the delft-making centres of London Liverpool and Bristol, favoured English flowers, landscapes, rustic scenes and portraits of wellknown personalities. The same brilliance of colour that is so marked on salt-glaze wares was not approachable on the yellower cream-ware of Wedgwood, Leeds and other lesser factories, but we find much attractive feathery scrollwork enclosing amusing verses or inscriptions. Many creamware globular tea-pots have the crabstock handles, spouts, and cover knobs, but two forms in particular, usually identified as Leeds ware, are well-known. One, globular in form has a scrolled loop handle, a spout moulded in grooves, and a snugly fitting lid with flower or plain knob, and the other, cylindrical in form, has a twisted double loop handle with flower heads applied at the terminals (in the Chinese style), moulded spout, and a flower-head cover knob. There is no space here to attempt to describe more than a few of the distinctive tea-pots made by the many factories in various kinds of earthenware, but mention ought to be made of the red or brown stone-ware ones, decorated in clear-cut relief with classical motifs, made by Hollins E. Mayer, Birch, Wedgwood and their imitators, the fine, white, moulded stone-ware pots of Castleford, with hinged or sliding lids within high galleries, the rather similarly shaped ones made by Pratt, of earthenware and decorated with high-temperature enamels, Wedgwood’s masterpieces in black basalt, and the famous unspillable ” Cadogan ” pots made at Rockingham` brown-glazed, filled from a hole in the base, and fashioned in the shape of a peach in imitation of Chinese sake-pots. By the time porcelain was wellestablished in this country the usual refined shape of a sensible tea-pot was finally decided and typified at best by the familiar perfectly globular shape made at Worcester during the first period. This very lovely pot has rim and foot-rim of almost exactly similar diameter and depth, a plain loop handle of round section which is sometimes grooved, and usually an open flower-head to the welldomed cover. The spout, opening into the body usually through five holes, is well-placed halfway up, and is always beautifully tapered. Very much the same pot was made at Liverpool, Caughley and Lowestoft, but it is useful to remember that whereas the inside flange of a Worcester cover is usually unglazed, that of a Lowestoft one is glazed. Another good Worcester shape has a sixteen-sided body, a plaited handle in the style of Leeds (but with no applied rosettes), and a moulded, grooved spout There are other Worcester varieties of the globular body, which was sometimes moulded in foliate and floral relief of surpassing delicacy, or which particularly when intended to be decorated in the Sevres style was given no welldefined rim or foot-rim. Good barrel-shaped pots were a Worcester speciality from the very early years, when small ones but 3* inches in height were sold in the white or slightly decorated with underglaze cobalt blue, moulded in sharp relief with floral or Chinese landscape motifs. Later, when the French decorative styles were in favour, about 1775, the barrel-shaped, finely ribbed, flat-covered pot was fashionable. At Liverpool, apart from the globular shape, a very handsome pot was made in a style once supposed to be a Longton Hall, one, almost ovoid in shape, with the body moulded on either side with three palm-trees to receive enamelled decoration, and with a moulding of overlapping lanceolate leaves rising from the footrim. Globular tea-pots were typical of the ” hard paste ” factories at Plymouth and Bristol, but with significant differences. The Plymouth variety usually has a much taller rim, with a more highly domed cover fitted with a plain knob, and at Bristol the familiar loop handle of Worcester and Liverpool was often replaced either by a more elaborate scrolled one, or by a double C form, the larger curve uppermost and fitted with a thumb rest. We find, too, a typical Bristol tea-pot of ogee or waisted form often accompanied by a moulded spout. Among strangely-shaped pots made at Longton Hall (where Littler clung long to earthenware traditions) were styles moulded in the forms of melons and pineapples, and others formed of moulded over-lapping leaves with appropriate rustic handles and spouts. In fact, in the eighteenth century as now, the teapot afforded ample opportunity for the exercise of a modeller’s imagination, though to be sure the results were usually less overpowering than the enormous midnineteenth century typical Rockingham pot with its elaborate, scrolled, high-rising handle and spout, and waisted capacious body, or the even more exaggerated monstrosities made at Castle Hedingham, brown-glazed and enamelled almost in medieval style upon relief ornament, that are sometimes to be seen as advertisements in tea-shop windows. In fact, of course, teapot development, at least as regards size, is exactly in step with the growing consumption of tea and with its decreasing cost.